Family Man - Notes: 200-209. 202. It’s that damn book again! 203. I enjoyed getting to show a little slice of the rhythm of university life. Nowadays they can keep college libraries open until the wee hours, but in the 18th century I would guess that the expense (and limited effectiveness) of candle and lantern-light meant these places would shut down the second it got dim. Taverns can afford lighting; they serve booze. And, speaking of bars, here in panel three is the nearest student watering hole. Lots of people who read my first book, Bite Me!, have noticed that the serving girl (and the bearded barkeep behind her) bear a marked resemblance to two characters from that story. Yes. It is a tribute to my own characters; I get to do that. This style of vaulting is Gothic era. The term “Gothic” actually comes from the same word as“gaudy”; it looks elegant and somber to the modern eye (especially in comparison to the chock-full-of-cherubs Baroque architecture that followed), but it was the Macy’s Day parade compared to the heavy, almost forcibly plain lines of Romanesque architecture. You can identify that architecture by the low, semi-circular arches – no graceful point in the middle. 204. More Fun With Architecture (™)! Watch the background change behind them as Luther and Ariana travel through tiiiiiime. Because what makes better foreplay than architecture and civic history? Panels one and two: churches were made for God, and were built high to get as close to the heavenly God as possible. Gothic churches can be very nippy as a result. Nice in the summertime, though. Panel three: Ariana explains the town’s previous incarnation. The University was founded only eighty or so years ago, so with the exception of a few repurposed buildings, it’s all new construction. The now-library was previously the headquarters of the regional church, and the now-Rector’s Mansion was the summer vacation spot for an extinct political family. Panel four: behind them, in one of those tricks that really only works in comics, you can see the old Romanesque arches that would’ve been there a few hundred years prior. Many Gothic churches were built on top of older churches, keeping some of the consecrated underground structure (like, you know, the crypt full of dead people). Some churches were built and rebuilt and patched up, resulting in structures with an altar from one century and a chapel from another and columns that are different in the front than the back, etc. A good example of this sort of patchwork church is the unassuming little St Julien le Pauvre in Paris. 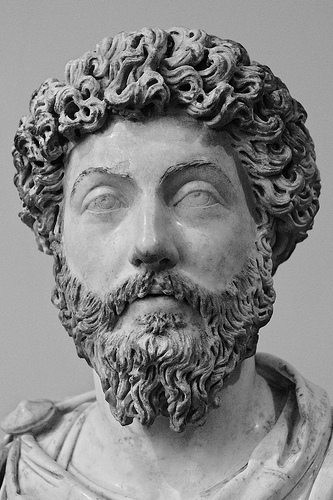 Panel five: Marcus Aurelius, who lived in the 2nd century, was one of the last genuinely defensible Caesars of the RomanEmpire. He was a bookish, earnest sort who was hand-picked as a boy for succession by his heirless predecessor. He most definitely did not want to be Caesar, which probably contributed to his being so comparatively good at it. One of his concessions to financial and political realities back home was to give up on taking over the far German territories. Ariana mentions the local tribes pushing the Romans back across the Elbe – actually, the Romans never made it to the Elbe (the tribespeople made sure of that…), and it was the Danube they retreated back over. Legions would establish forts as their home base in foreign territories, and Familienwald was the site of one of those forts. They didn’t often have full blown sacred temples in camps – they had a small aedes, where they kept the legionary standard, likenesses of the Emperor (a deity in his own right), and a few other objects of worship. Maybe this particular legion commander was a kook for the goddess Diana (Artemis, to the Greeks). Behind Luther and Ariana you can see the wooden roof and the statue. Greek and Roman statues were painted in bright, garish, lifelike colors. Likewise, many Romanesque and Gothic churches were colorfully painted, outside and inside. If you were an illiterate worshipper, you darn well wanted your church to be a riot of color and story. 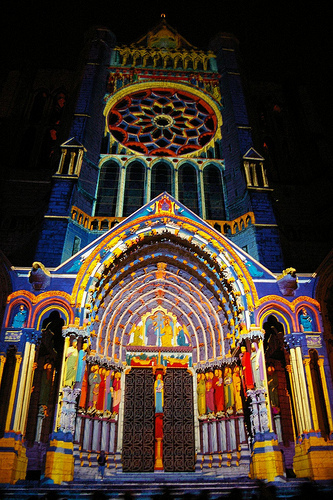 If you visit Chartres for the Festival of Light, you can see the cathedral “painted” with a digital projector. Panel six: I ain’t tellin’ and neither is she. 205. More fun with gargoyles. I think I made this one up from a combination of a few favorites. 206. 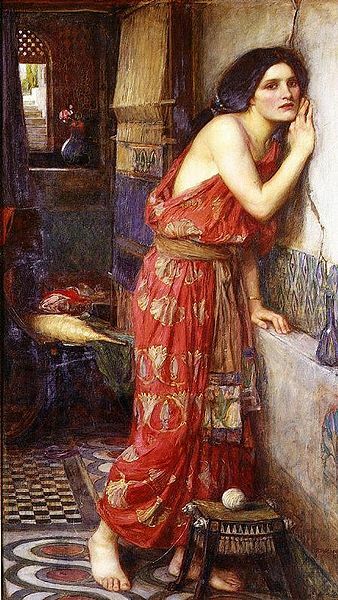 Pyramus and Thisbe: If your high school had a drama program, you probably know “Pyramus and Thisbe” as the play-within-a-play in Shakespeare’s A Midsummer Night’s Dream. The goofy workmen put on a deeply hapless production of the tragic play to entertain the Athenian court at the very end of the show. Pyramus and Thisbe is a Greco-Roman fairytale and a Romeo and Juliet analogue. Two young people (Pyramus is the dude) come from warring families who happen to live right next door to each other. They fall in love on the street, but their families find out and imprison the young lovers in their separate homes. They continue their love affair by whispering into a crack that’s opened in the single wall shared by the two houses. Finally they can stand the separation no longer and arrange to meet outside of town by moonlight and run away together. Since this is a tragedy, a series of ill-timed mishaps (involving a bloody kerchief and a wild lion!) result in mutual despair and suicide. So Luther’s making rather a colorful reference to a courtship that involved a great deal of contorted planning and didn’t turn out so well. 207. There are a lot of steamy hen house assignations in my stories. Cf Bite Me! again. That said: as long as it’s been properly mucked out and there aren’t any chickens in it anymore, a hen house could be a GREAT spot for youthful make-outs. Some of them are pretty big, and who’s going to see you? And here is a small nub of fraternal detail. Johann totally bagged Luther’s girl. Are you surprised? Luther sure wasn’t. 209. I think that, in the eighteenth century, getting all the clothes off must have been half the fun. Forcibly, because you’d be so tired by the time everybody was finally naked. Underwear and particularly stockings from this era are still a source of debate in historical costume circles. There aren’t a lot of surviving examples since such items were more delicate and fragile (and less impressive) than outer layers of clothing, and there are few pictorial sources of people in clinically distinct levels of undress. But we can all make good guesses. Ariana’s are over-the-knee stockings that you’d keep up by tying off a ribbon. The chevroned wrap around her torso is not properly a “corset” (that term kicked in around the 19th century) but stays; stiff, shape-giving garments, lined with cheery stuff like whalebone. They went on over the chemise and petticoats but under the actual gown. Lots of women’s garments weren’t actually permanently sewn together, but were pinned together on the body a daily basis. There were no zippers or velcro back then. Let us hope nobody comes away from this encounter with a stabbed finger.